CSUN biologists have traced interactions between Cripto, a signaling protein associated with development and stem cell regulation, and other molecules that direct tissue regeneration. The results are presented in a paper recently published in the journal Biochemical and Biophysical Research Communications. The paper — lead-authored by CSUN Biology almuna Malachia Hoover, with CSUN Biology postdoc Farhana Runa, Master’s student Sa La Kim, and Associate Professor Jonathan Kelber, in addition to collaborators at the Salk Institute — documents experiments that find Cripto interacts with Myosin II to promote stem cell proliferation as part of the regeneration process in a zebrafish model. Hoover et al. first built a database of known interactions — an interactome — among proteins previously found to bind to Cripto. This analysis identified Myosin II component proteins as important, and the authors directly validated this relationship using immunoprecipitation, Western Blot and microscopy. Finally, they compared regeneration of injured zebrafish tailfins treated with compounds that inhibit Myosin II, Cripto, or the two together, and found that all three treatments showed similar inhibition of regeneration relative to untreated controls. The full paper is available on the journal website. 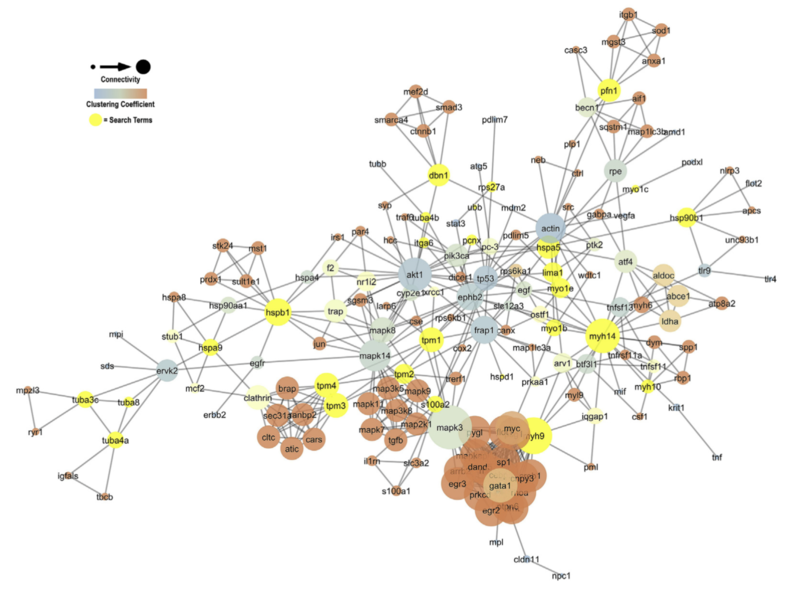 Image: Interaction network of proteins with previously known association to Cripto, from Figure 1 of Hoover et al. (2019).